We originally scheduled this trip for the February full moon, but a snowstorm prompted us to change plans. Now, four weeks later, we had to accommodate a longer period of daylight, diminished snow depth, and a moon that was several days less than full. The weather report called for a 20 percent chance of snow showers, mostly cloudy, with a low around 15 - but fortunately, everything turned out well, making this one of our "best" moonlight trips. 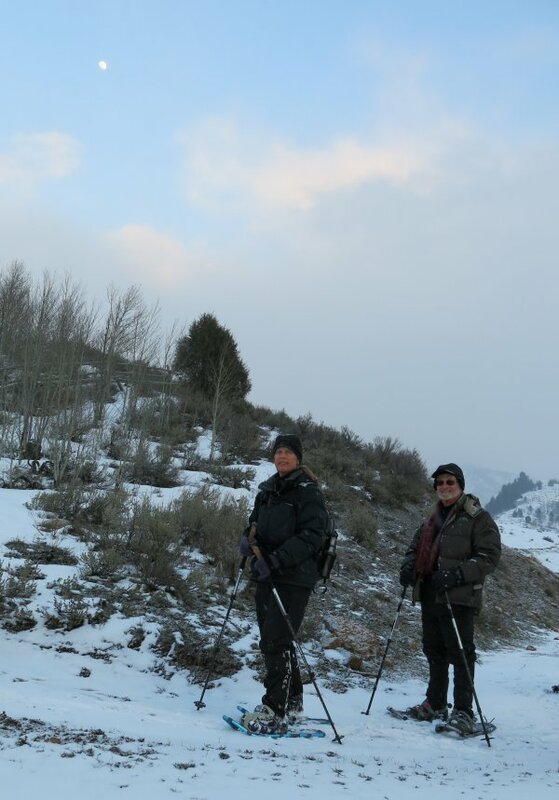 Six Cache Hikers came on this last scheduled winter trip of 2013. 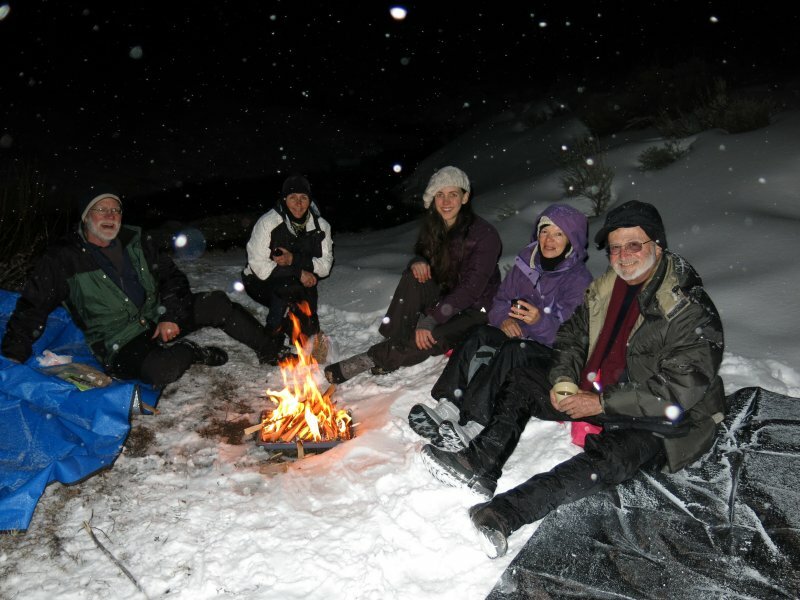 Everyone used snowshoes: Dave W., the leader, Jane, Alexi, Jeanne, Tim and Terry. The group met at 6:00 p.m. in Logan, organized into carpools, and drove up Logan Canyon to Temple Fork. The snow that blocked access to the Temple Fork parking area was mostly gone, so we were able to drive over the bridge and park there, eliminating the need to start 1/3 mile away at the Blind Hollow. At 6:40 we started out by carrying our snowshoes for 1/4 mile until the snow was deep enough to use them. The later date - and daylight savings time - meant the sun did not set until we had gone 3/4 of the way to our destination on Spawn Creek. 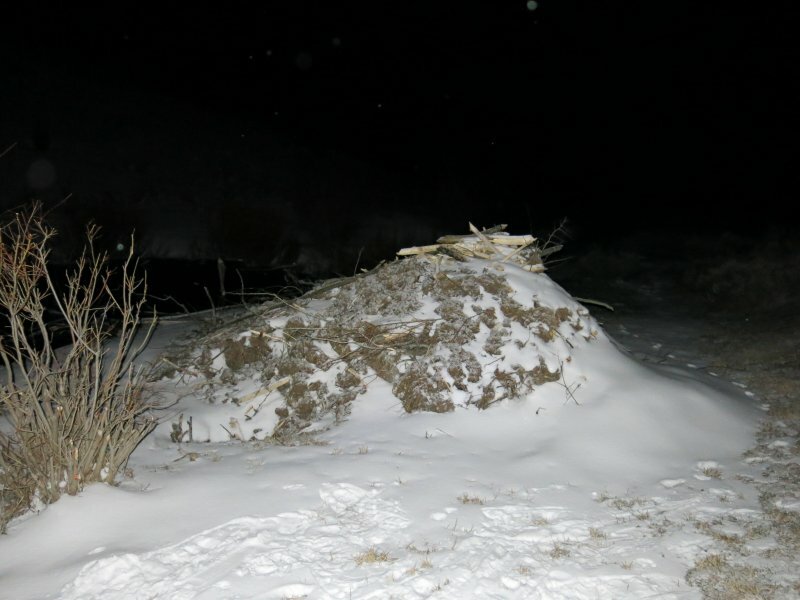 Upon reaching our Spawn Creek site, we found that the knee-deep snow of February was almost gone, exposing our previously buried bags of firewood and there was no trace of the bench we had dug in the snow. Instead, we put the fire pan on a bare patch of ground and sat on tarps as we shared mint patties and Moon Pies, a traditional treat for these events. After the fire burned down, we forded the shallow creek and went a short distance to see a recently constructed beaver dam and lodge. Our walk back was delightful - a winter walk in the moonlight to remember. There was no breeze and while it was below freezing, we were warmly dressed. It had been snowing lightly while we were at our destination, but the sky cleared as we returned. The moonlight was so bright we did not need our headlamps and the constellations appeared as the clouds dissipated. We saw Orion,the Big Dipper,Cassiopeia and the North Star. The snowy hillsides were illuminated with moonlight, contrasting with dark trees in an abstract pattern reminiscent of a high-contrast black-and-white photograph, and the surface of the snow sparkled in the moonlight. Our ears were treated with the crunchy sound of our snowshoes on the crusty snow and the sound of rushing water in the creek. The only thing missing was a wildlife experience, perhaps an owl hooting, like we have had on previous trips. The trip totaled 4.1 miles with about 330 feet of elevation. We arrived at our vehicles at 10:05.